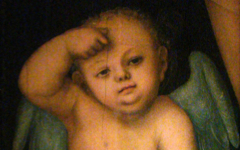 ......on a 1503 painting by Jacopo de' Barbari which Cranach happened to own. 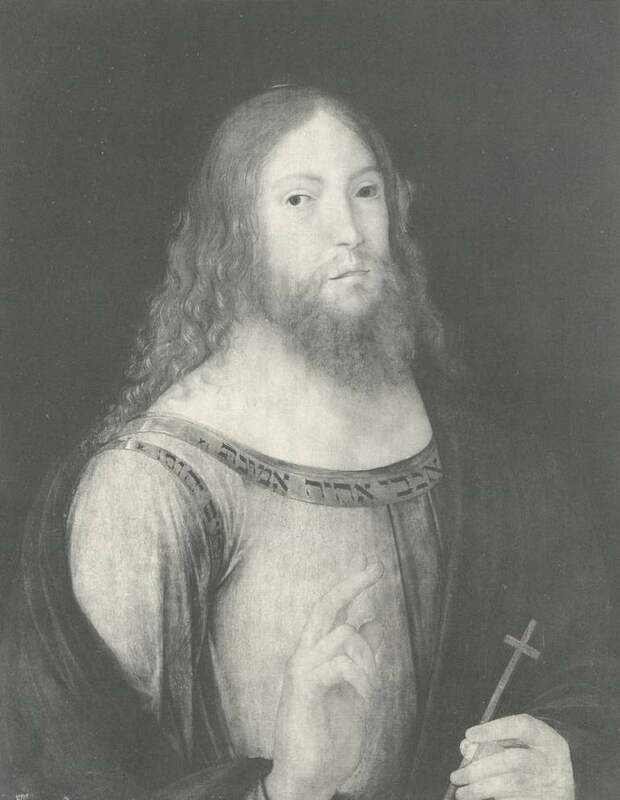 Koerner added that this painting had by 1553 come to be thought of as an accurate likeness of Christ, helped possibly by the seeming authenticity of the Hebrew lettering. 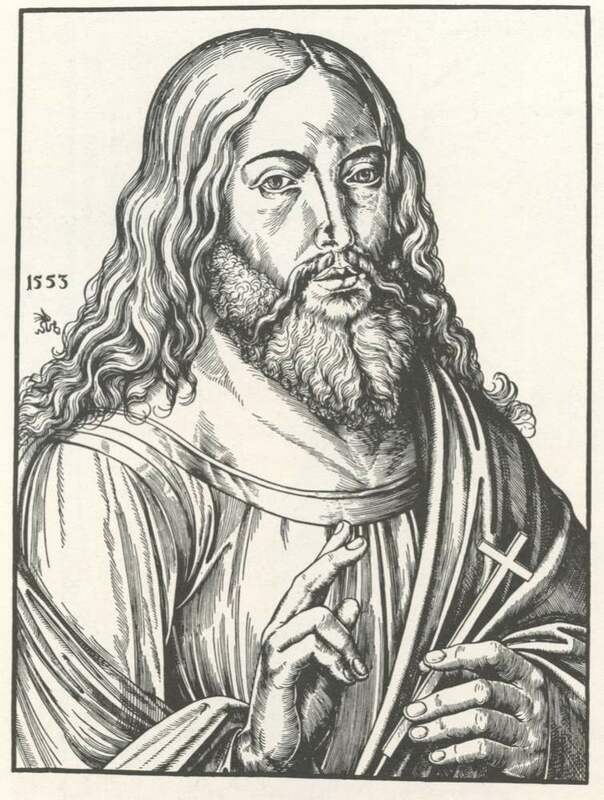 It is even possible, he claims, that this painting is based on Durer's 1500 Self-Portrait resembling Christ.1 If so, Cranach knew that this Christ was based on an "artist", the great German artist, Dürer. Koerner misses this last point. 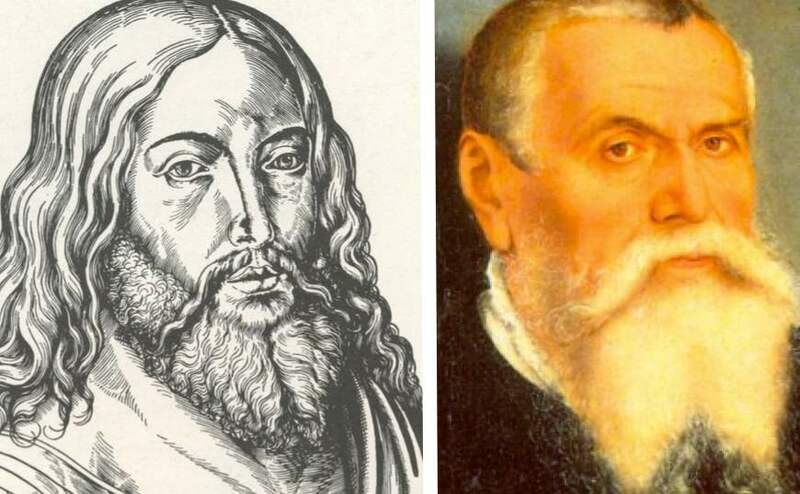 He also failed to see that Cranach's woodcut of Christ, even if based on Jacopo's painting, resembles Cranach himself. Perhaps Cranach purchased Jacopo's portrait because it resembled him or he later came to identify similarities which he was able to accentuate in the woodcut. Whichever way, Cranach executed the woodcut after Jacopo's painting not because it resembled the authentic body of Christ but himself. There is an irony here. While this image superficially seems to address the needs of Biblical literalists for an authentic image of Christ, Cranach really drew it as a Christian mystic who knows that by focussing inwards we can each find God inside our own self. What can one learn from the single fragment of a larger painting? A lot, if you look. In Cranach’s 1506 woodcut of Venus and Cupid, Cupid is the artist drawing back the bow to shoot his “victim”. 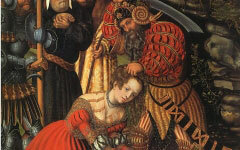 See how Cranach represents himself as an evil man executing "his painting" of spiritual perfection. Original Publication Date on EPPH: 18 Oct 2011. © Simon Abrahams. Articles on this site are the copyright of Simon Abrahams. To use copyrighted material in print or other media for purposes beyond 'fair use', you must obtain permission from the copyright owner. Websites may link to this page without permission (please do) but may not reproduce the material on their own site without crediting Simon Abrahams and EPPH.